Our customers keep adding our new real-time low latency protocol SLDP into their streaming workflows as it allows sub-second delay for live streaming delivery. Some basic usage of SLDP protocol is described in this article which describes typical usage scenarios. People ask us about adding new capabilities into SLDP technology. One of them is adding VP8 and VP9 codecs - those are open and royalty free video coding formats developed by Google. Nimble Streamer Live Transcoder now supports these protocols transcoding in addition to already supported VP8/VP9 transmuxing feature set. SLDP is codec-agnostic protocol so in order to have full support for VP8/VP9 from source to the viewer, we only needed to add it into our HTML5 player. So today we'd like to announce that VP8 and VP9 support was added into SLDP HTML5 web player. This type of playback fully depends on platform support, so it can be currently played in Chrome, Firefox and Opera and possibly in Microsoft browsers over time. You can use SLDP for streaming in various bitrate modes. First you can stream single-bitrate VP8/VP9 if you know your target audience can play it. Another option is to create ABR group to include streams encoded with both H.264 and VP8/VP9. In this case our SLDP HTML5 player will choose stream with H.264 codec if target browser or platform doesn't support VP8/VP9 playback. That would give you capabilities for flexible delivery of your content to multiple platforms. We'll be adding other codecs support per our customers' requests so please contact us to get help or suggest new features. RTMP republishing is widely used by Nimble Streamer users to deliver live streams to various types of destinations, including other media servers, CDNs, YouTube or Twitch. Periscope live streaming platform also takes RTMP streams as input so our customers use that as a target too. As Periscope requires some additional stream setup, we've created a dialog in our UI to cover that use case. As a source for your stream you can use any delivery method supported by Nimble Streamer. Once the input stream is taken by Nimble, you can perform a setup for publishing it to Periscope. VP8 and VP9 are open and royalty free video coding formats developed by Google. Nimble Streamer Live Transcoder now supports these protocols transcoding in addition to already supported VP8/VP9 transmuxing feature set. Live Transcoder allows performing both decoding and encoding. To receive VP8 and VP9 for transcoding, Nimble Streamer allows processing RTSP from published and pulled sources. The result stream can be delivered using RTSP protocol as well. 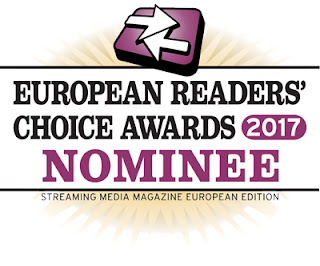 The Streaming Media European Readers' Choice Awards 2017 voting has been started to get industry opinions on the best solutions on the market. Last year we were selected as the finalist for best streaming innovation for Nimble Streamer. Let's see what we get this year. Our company is presented in 4 nominations and we hope to get your votes. Here's a brief instruction how to proceed. Go to voting page here, enter your name and contacts to see the full list of nominees. We hope you enjoy our products and will choose them in the list. Voting closes on August 1st, and at that point, all voters will receive an email asking them to to confirm their votes; only these confirmed votes will be counted. The finalists will be announced on 15 August, and the winners will be announced in the Autumn issue of the European edition of Streaming Media magazine. Thanks for being our loyal customers, looking forward to getting your votes. Secure Reliable Transport (SRT) is a transport technology that optimizes streaming performance across unpredictable networks. It's applied to contribution and distribution endpoints as part of a video stream workflow to deliver the best quality and lowest latency video at all times. As audio/video packets are streamed from a source to a destination device, SRT detects and adapts to the real-time network conditions between the two endpoints. SRT helps compensate for jitter and bandwidth fluctuations due to congestion over noisy networks, such as the Internet. Its error recovery mechanism minimizes the packet loss typical of Internet connections. AES 128/256 bit encryption is also supported for end-to-end security, keeping your streams safe from prying eyes. Our company, Softvelum LLC, became a member of SRT Alliance which is a group dedicated to managing and supporting the open source implementation of SRT. This alliance is accelerating interoperability of video streaming solutions and fostering collaboration with industry leaders to achieve lower latency Internet video transport. Softvelum is actively contributing to the community to improve the protocol and its ecosystem. Both Push and Listen delivery modes are supported. Both Listen and Pull receive modes can be used to get SRT streams for further processing. Rendezvous mode for sending and receiving is supported. Custom "latency" and "maxbw" parameters are supported for fine tuning. Multiple streams can be sent via single SRT channel. Multiple Pull-mode clients can be supported when working in "Listen" mode, see section "Set up sending via SRT" section for details. Mux rate can be set correctly - Nimble Streamer has 100% PCR accuracy, 0ns PCR drift and PCR interval <20 ms according to StreamGuru. This is typically used for precise testing of channel throughput. AES 128 bit encryption provides stream security. Using Nimble Streamer transmuxing engine, you may create any supported live protocol output from SRT, as well as receive any of them to create SRT. Let's see how SRT can be enabled and used in Nimble Streamer.